BRUNSWICK, Ohio - It was pouring rain at the outdoor pancake breakfast in this northern Ohio town just moments before Mitt Romney arrived to address the crowd on Father's Day. But moments after taking the stage, the sun began to shine on the nearly 1,000 breakfast-goers, leading the presumptive GOP nominee to compare the improving weather to the state of the country -- as long as Barack Obama is voted out of office. "Boy, that sun feels good, you know that?" Romney said to the crowd as people began putting away their umbrellas and removing plastic garbage bags that acted as rain ponchos. "Things are drying out here. This feels great! And I can tell you something else - the sun is coming out in this country. Our brightest days are ahead. Things are getting better in America as long as we get off the course he's put us on." Romney continued the weather metaphors throughout his speech, telling the Ohioans that "three and a half years of dark clouds are about to part." He even found a weather-related way to attack the president's signature piece of legislation, the Affordable Care Act, which he called "a great cloud that's been raining over small business." Romney is on the third day of his bus tour through battleground states, with Sunday's itinerary taking him across the state of Ohio. Two of his sons -- Matt and Craig -- flew in to join their dad on the trail, along with their wives and five of Romney's grandchildren. 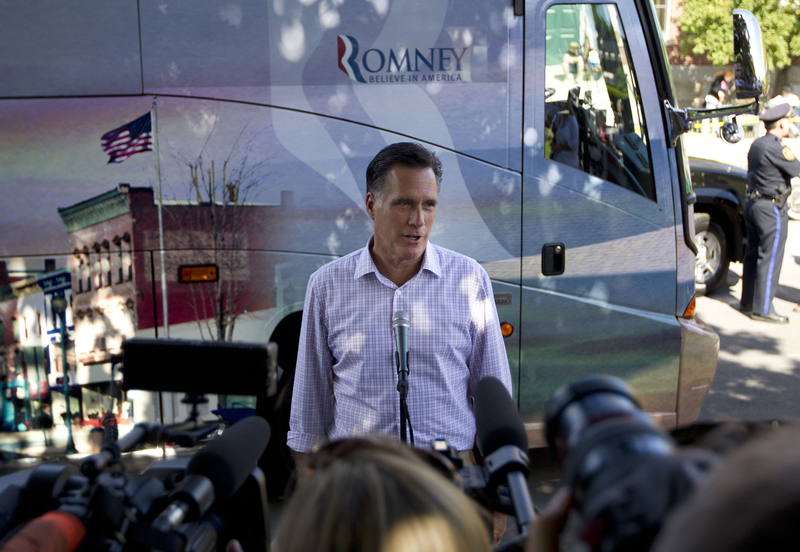 At Sunday's initial event in Brunswick, Romney was not interrupted by a mass of protestors . But at a subsequent appearance in Newark, Ohio, at least 25 protestors shouted so loudly that Ann Romney remarked to the crowd at one point, "It looks like we're having an emergency in the background." The Democratic National Committee has been doggedly following the tour and held a news confernce on Sunday afternoon in Madison, Wis., to highlight what it said were Romney's failures as Massachusetts' governor and what it said was his wrongheaded economic agenda. "This bus tour is called the `Romney Economics: Middle Class Under the Bus Tour,''' DNC spokesman Brad Woodhouse said. "It's a fitting name because that's exactly what Romney Economics would do for the middle-class and the hardworking people across this country. He'd actually throw the middle class under the bus to advance his trickle-down economics agenda to protect the very wealthy people like him in this country at the expense of the hard-working people in Wisconsin." The DNC also sent the media articles on how Romney had to reschedule an event in Pennsylvania after Obama supporters rallied at the bus tour stop. Both of Romney's sons used the occasion of Father's Day to pay tribute to the man who raised them, along with their mother Ann. Matt, Romney's second oldest, told a story about how his father had helped out when his wife was on bed rest during a pregnancy, building her a television cabinet and installing cable in her bedroom and finding someone to help her run errands. "I just look at that," Matt said while sharing the stage with his dad. "He taught me to be both a father and a husband. " Romney's youngest son, Craig, was also in attendance, along with his son Parker, who was often seen on the trail with his grandfather in 2008. The family is traveling throughout the state with Romney along with Ohio Sen. Rob Portman, who served pancakes with the group following Romney's speech. Portman is considered a likely contender for the vice presidential nomination, though he downplayed the possibility when it was brought up by one of his constituents in the pancake line. "I'm happy where I am, you know?" Portman told the man. "I'm lucky to be where I am."